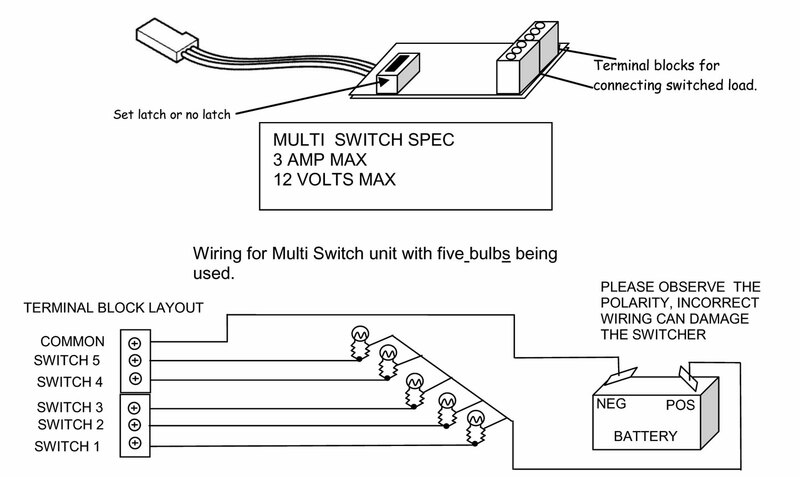 The 5 Way Multi Switch is intended for use with model boats for situation where you want to switch lots of items on and off and have a limited number of channels on your radio. The unit can be operated in latching or non-latching mode, on any of the outputs. 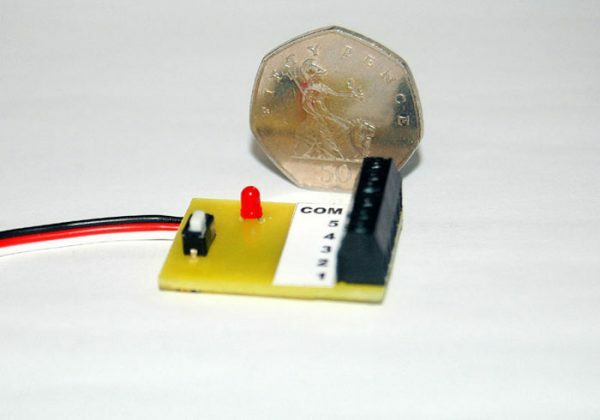 Two units can connect to the same channel to give 10 outputs! Each output can be individually set to have a latching (the default) or non-latching action. The stick direction is set by the user to give active high (or right) or active low (or left) operation. You control the ancillary units by moving the operating stick a number of times from neutral to high (or from neutral to low if reverse is selected). If it is selected that operating the stick to high is on, moving and holding the stick at high will toggle output 1. Moving the stick: high, neutral, high and hold will toggle output 2. Moving the stick: high, neutral, high, neutral, high and hold will toggle output 3. The Multiple Output Switch unit counts the number of times that high is selected and toggles the appropriate output from off to on or from on to off. The output will activate with the first operating stick sequence and remain active when the operating stick is returned to neutral. A second stick sequence is required to deactivate the output. As a practice aid, the set-up LED flashes each time a stick high condition is detected. The LED goes out once the output is activated (i.e. a pause is detected). When a non-latching action is selected for an output, the output will be active while the stick is held high and off when the stick is returned to neutral. The operating stick can be moved as fast as your radio system can respond but the output will not activate until the stick has been high for about half a second. Similarly, the output will only deactivate after the stick has been at neutral for more than half a second. The delay tells the Multiple Output Switch unit that the stick sequence is complete. This means that you must pause for about half a second to allow the system to reset before starting a new stick sequence. If you wish to operate two units from one channel, set the units individually to be operated by opposite stick direction movements. Before operating or adjusting your Multiple Output Switch, reset the transmitter operating channel travel to 100% and the operating direction to normal. Move the transmitter operating stick to high (active) and switch on the transmitter and receiver. The set-up LED should flash brightly once to confirm that the stick is active. If it does not, the transmitter stick direction must be reversed as indicated below. To change the operating stick direction, switch the Multiple Output Switch unit off. Press and hold the SET key and switch the Multiple Output Switch unit on. The set-up LED glows to confirm that the set-up is active. Release the key. The set-up LED goes out to indicate that the set-up is complete. The operating stick action is now reversed. Each time you perform this set-up action, the stick operating direction will toggle from forward to reverse or from reverse to forward. Use the operating stick to activate the output that you wish to change. For example, to make output 2 non-latching, operate the stick: high, neutral, high and hold. Press the SET key until the set-up LED lights. Release the key and the set-up LED goes out to indicate that the set-up is complete. The output now has a non-latching action and will activate when the stick sequence is received and deactivate when the stick is returned to neutral. Repeat this procedure on the same output to change the output back to a latching action. Each output can be changed from latching to non-latching and back as many times as you wish. The Multiple Output Switch unit remembers all new settings and it is only necessary to perform the set-up when you wish to alter the stick operating direction or the latching action of an output.